On Saturday September 22 Victoria Puttock and Mark Dancer will be giving an evening concert of music for saxophone and piano in St Peter’s Church. Most people tend to think of the saxophone purely as a jazz instrument, but there is a substantial repertoire of classical compositions for the instrument, and they will be exploring it over the course of the evening. The music to be heard will range from the rustic charms of Paule Maurice’s Tableaux de Provence, across the Atlantic for some very varied American works for the instrument, and back to France for some Spanish-inspired music by Henri Busser and the well-known Fantasia on Themes from Bizet’s Carmen by François Borne. Victoria Puttock hails from Petersfield and studied at Trinity Laban Conservatoire in London and then at the Royal College of Music, graduating with distinction in her Master’s degree. 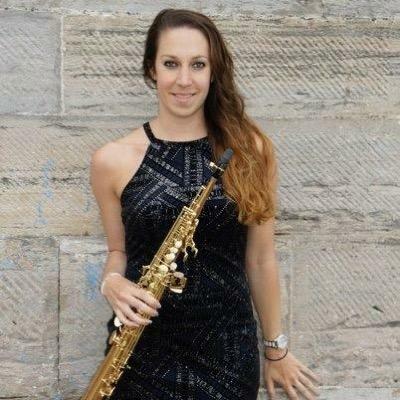 She prides herself on championing the core repertoire for the saxophone, whilst exploring new works that showcase the full range of this diverse instrument. Victoria has performed at many prestigious venues including Royal Albert Hall (Elgar room), Cadogan Hall, V&A Museum, National Portrait Gallery, St John’s, Smith Square and the Southbank. Victoria is an active chamber musician and has worked with many ensembles including the Bournemouth Symphony Orchestra, London Sinfonietta Academy, London Philharmonic Orchestra, London Electronic Orchestra and the Multi Storey Orchestra in the BBC Proms. Mark Dancer is a familiar face on the Petersfield musical scene, having been teaching, directing choirs and performing in concerts in Hampshire either as soloist or accompanist for more than twenty years. He is Director of Music at St Peter’s Church, Petersfield and conducts the Petersfield Choral Society. He is much in demand as an accompanist both on organ and piano, known for his sensitive and sparkling style of playing. He and Victoria first performed together in 2016 at the Michael Hurd Bursary Award Winners’ concert and have given several concerts together since to great acclaim.